Iron Gear Box is a block added by the Thaumic Energistics mod. 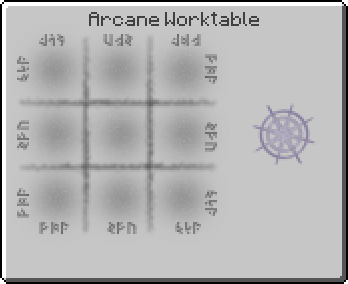 It can be placed in the world and can be powered by the player the same as Wooden Crank. It will power all Quartz Grindstones connected to it with their input side. Also if multiple people are rotating it, the power will multiply. "Your experiences with the Wooden Crank has left you to wonder, could this be improved? You have devised a way of setting up a series of gears in a box so that when any side is turned, all other sides will also turn. However you will need a stronger material than wood, to that end you have created the Iron Gear by bonding iron to a wooden gear. The Iron Gear Box will allow you to crank multiple devices simultaneously. You will need to orient the devices so that their input faces the gearbox. When cranking multiple devices, such as a two grinders & a charger, the crank power will be split evenly between all devices that are currently able to be cranked. Another advantage of the gearbox is that it can be used by multiple people simultaneously. Each person cranking the gearbox will add to the crank power output. Now if only you had someone who would stand around all day and crank this for you..."
This page was last modified on 4 July 2016, at 13:24.